We take it for granted today, but 30-plus years ago it wasn’t obvious that the National Center for Biotechnology Information would become a powerhouse of molecular biotechnology information for millions of users every day. 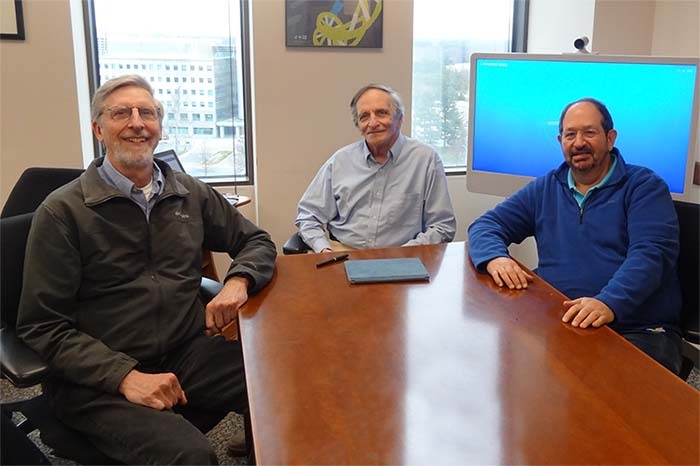 NLM in Focus spoke with three scientists who were with NCBI in the beginning—and are still here: Dennis Benson, PhD; David Landsman, PhD; and Jim Ostell, PhD, the current director of NCBI. With wit and wisdom that only 20/20 hindsight can bring, these three NCBI leaders share the early struggles, uncertainty, and excitement from the first decade of NCBI. In the end, Benson, Landsman, and Ostell reveal why they’re really still here. 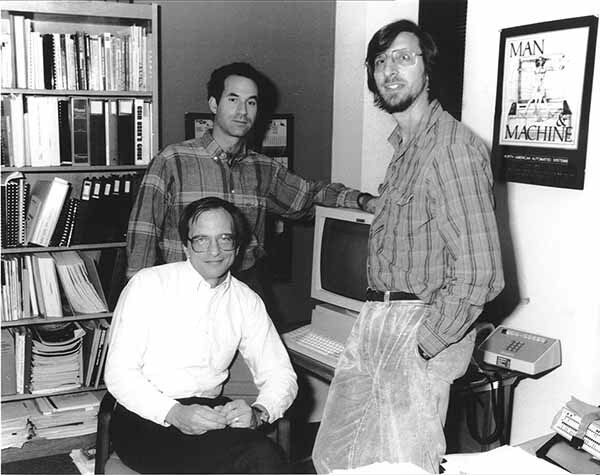 “In the mid-1980s, bioinformatics was seen as this bastardized field because it wasn’t computer science and it wasn’t biology,” said Ostell. At the same time that biologists and computer scientists were trying to define bioinformatics, a delegation for biomedical research began briefing sessions on Capitol Hill, and the newly formed Friends of the National Library of Medicine sought out the legendary Senator Claude Pepper (Florida), who expressed interest in establishing a national center for biotechnology at NLM. 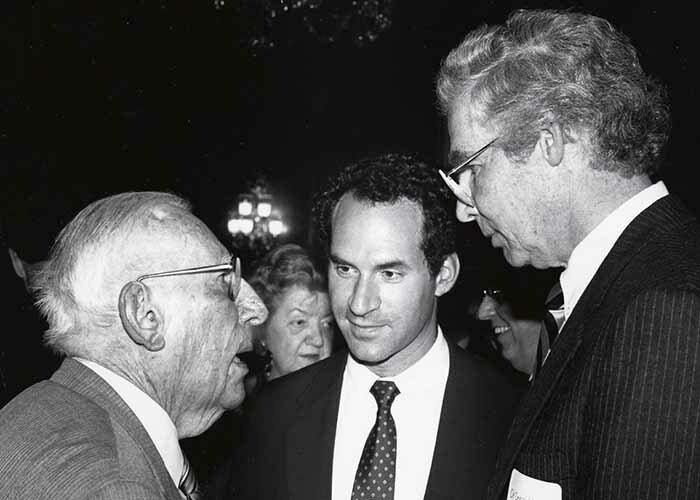 Dr. David Lipman (center) speaks with Claude Pepper (left), the former US representative from Florida, and former NLM director Dr. Donald Lindberg (right) at a 1989 reception on Capitol Hill celebrating the passage of Pepper’s bill creating NCBI. If a new center at NLM was to be established, Benson, a branch chief at the Lister Hill Center, and Daniel Masys, former head of Lister Hill Center for Biomedical Communications (and a current member of the NLM Board of Regents), had work to do. “We needed to drum up support and recruit people so we’d have something in place if the legislation actually took place,” said Benson. They brought in David Lipman, MD, from the National Institute of Diabetes and Digestive and Kidney Disorders and a key developer of the FASTA algorithm. Donald Lindberg, NLM Director at the time, appointed Lipman the director of NCBI, a role he served until 2017. In November of 1988, four days after Ostell arrived on campus, the National Biotechnology Information Act passed and NCBI was born. Landsman, who had been working in a lab using computer tools at the National Cancer Institute, joined NLM in May 1989. “With Ostell and Landsman on board there were about a dozen people on staff,” recalled Benson. Benson, a neurobiologist, was in charge of the computer systems; Landsman, a biologist, was involved in basic research and developing tools for evolutionary biology; and Ostell, a computational biologist before the term existed, would be building production resources. The budget was about $8 million. They weren’t 100% sure of their goals: “What does NIH want us to do?” they wanted to know. GenBank, an annotated collection of nucleotide sequences and protein translations, was growing and would need tools designed to analyze the sequences—but how would that work? The founding leadership of the National Center for Biotechnology Information (NCBI), ca. 1988. From left: Dennis A. Benson, PhD (seated), James Ostell, PhD, and David J. Lipman, MD; not pictured: David Landsman, PhD. The director of NIH called a meeting. “We had about a day’s notice to present our plans to [then NIH Director James] Wyngaarden, of which we had none at the time,” admitted Ostell. But they had considerable experience in informatics—plus enthusiasm. “We threw together the concept that became Entrez,” said Ostell. This text-based search and retrieval system would eventually be used for all of NCBI’s major databases, but at that point it wasn’t developed. “It wasn’t even a plan,” said Ostell. “It was an aspiration,” recalled Benson. “We could take a modern way of representing data,” recalled Ostell. But they didn’t need to start from scratch. “We picked an ISO standard data description language used for network communication, instead of inventing a new format, and created a model of the data that included DNA, protein, and published literature in order to integrate information held in multiple, disconnected databases at that time,” said Ostell. This deliberate decision was crucial. They presented the idea to major developers of molecular biology software, letting them know that they would make all the data available plus provide support. He was “bummed out,” but didn’t back down. “We thought it might help if we created a demonstration to show the power of the idea,” said Ostell. The first version of Entrez integrated protein sequences, DNA sequences, and a subset of the literature indexed in MEDLINE. They put it on CD-ROM and built indexes and tools that allowed users to work with the data on their PCs or Macs. 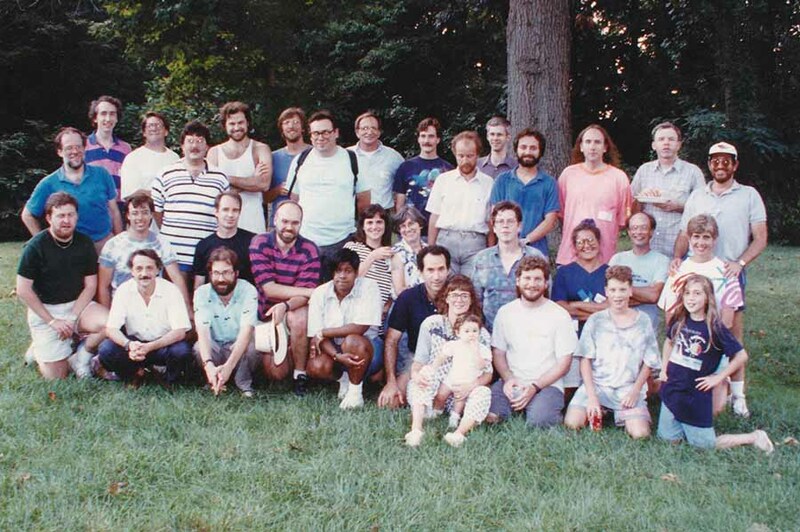 An early gathering of NCBI staff and family members, ca. 1992. The group has grown to over 700 employees and contractors today. Ostell gave an example of how this might help researchers learn more about colon cancer—a process that previously would have required many months. The ability to do this kind of computation was free and available—from NLM. Poster from an early forum regarding MEDLINE on CD-ROM. Scientists were thrilled with the level of power the integrated information gave them. After going to what seemed like hundreds of meetings and classrooms to demonstrate Entrez, Ostell was discouraged. Instead, he hit the pause button. As the data got more plentiful, the CDs NCBI was using for distributing data kept getting bigger. Luckily, there was a new solution. “We shifted to start using this new internet thing,” said Ostell. Users could now get Entrez without having to insert CDs in their computers. The interest in NCBI’s resources grew. NCBI started adding more resources, such as a taxonomy of organisms’ names and the addition of protein structure information. “Then someone said, ‘There’s this thing coming up called the World Wide Web, and you guys should look at it,’” said Ostell. And yet, it turned out to be good enough. With additional content driving demand for access, the NCBI team looked for ways to leverage the World Wide Web to make their resources more available. 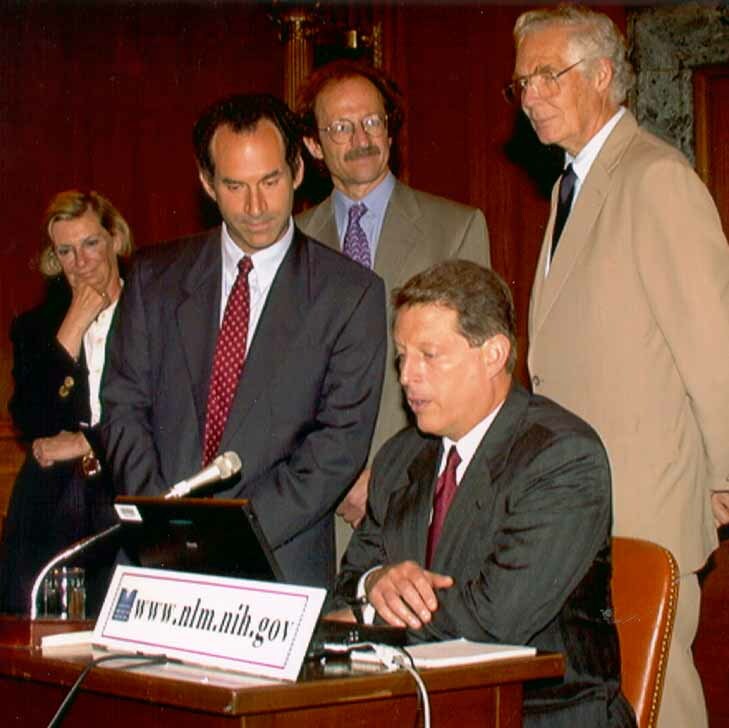 NCBI Director Dr. David Lipman (second from left) stands by as Vice President Al Gore (seated) tries out free access to MEDLINE via PubMed at a Capitol Hill event on June 26, 1997. They are joined by (l to r) MEDLINE user Suzanne McInerney, NIH Director Dr. Harold Varmus, and NLM Director Dr. Donald Lindberg. “Because MEDLINE at this point was still subscription-based, you had to register with NLM to get an account to get access to the mainframe-based system called MEDLARS,” Benson explained. The Web offered a way around that. NCBI launched PubMed as an experiment in January 1996. The new database provided free web access to NLM’s biomedical journal literature in MEDLINE with added features like links to related articles. Sixteen months later, declaring the experiment a success, NLM dropped the term “experimental” from the site. They took care of any complaints and started a kudo file, which still exists. Over 30 years that file has grown tremendously, as have NCBI’s offerings. Entrez has been joined by dozens of other databases which, collectively, are used 24 millions times per day by 5.5 million users. All that usage translates to 200 petabytes of data moving in and out of NLM’s networks daily. NCBI does, indeed, matter. With all that success, Landsman, Ostell, and Benson could have forged successful careers in the private sector or at a university. Instead, they stayed at NCBI. Long-time leaders at NCBI, (l to r) Jim Ostell, Dennis Benson, and David Landsman, reflect on their history at NLM. April 15, 2019 in History.